Founded in 1903, Newport Golf Club is one of the best parkland courses in South Wales and it’s set some 300-feet above sea level among the birch, beech and oak trees of the Llwyni Wood. There are far reaching views of the surrounding countryside from both the clubhouse and the course itself. It’s a pretty place to spend some time and play golf. Host to a number of important Welsh and National Amateur events, Newport Golf Club is founded on solid traditions and is highly regarded within Welsh golf. But you’ll need to be a member of a golf club to get a game here, so remember to either take your handicap certificate or a letter of introduction from your club secretary. 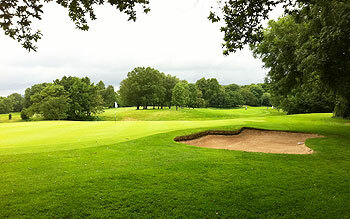 The topography is gently undulating, parkland turf is lush and bunkering is clear and strategic. It’s a course you can retreat to and enjoy when you’ve suffered sufficiently from the windswept seaside links courses. Newport is pleasantly sheltered from the elements by the woodland and the rolling hills. It’s a veritable oasis. Name one better parkland course in South Wales, not including 2010. Definitely better than a top 32 spot in Wales, in the parkland stakes only the 2010 course, St Pierre and Rolls of Monmouth can be compared to it, great variety and superb condition with immaculate greens, and very friendly. I had the feeling of playing Boat of Garten while playing it. I would put Newport at between 12 and 15 for Wales it really is that good. The last of the three courses we played and another good choice that left us satisfied. A nice gentle start to the round with a short Par 4 followed by a short Par 3 then the course opens up, the back nine is better as there seemed more elevation changes and the views are pleasant to look at if your game is not flowing. What we did not like was the odd sections of un-sited rough left to grow in between parts of a fairway (most unfair when you hit a great driver or second shot on a Par 5 straight down the middle only to find you’re in the rough !). All of the greens were a nice even pace and a joy to putt on, with some having some testing slopes ! Always in perfect condition with great greens. Every hole is so different from the previous hole, with many 5 star holes. If you're coming to play the 2010 course please make time for this rare treat, I still believe this to be the best parkland course in Wales, and you could easily play 36 in a day. Highly underated, a must play course. Playing at Newport Golf Club is always a pleasure as the course is usually perfectly maintained, especially the greens that are fast and undulating. Have a feeling that the par here is 74 so it’s a longish challenge that will favour the lower handicapper and whoever has a hot putter. A friendly club that caters well for the visiting golfer Newport will always come highly recommended by me.